How are you using Soccer WhiteBoard? What new features would you like to see? We are looking to begin work on the next incremental update to all of the sports white board applications and would like your feedback. Please use the "Contact Us" screen to let us know what you would like to see. We are hoping to add animation and puck "attachment" in the next release, but what else would you like? 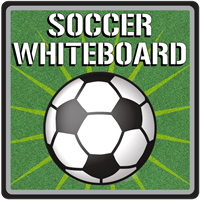 Soccer WhiteBoard Version 2.0 has been released on the App Store! Use the "View in iTunes" link to the left to see it in the AppStore. Soccer WhiteBoard version 1.7 implements many of the new features available in Hockey WhiteBoard version 1.7. Soccer Whiteboard does not have any preset configurations other than the basic 3-4-3. However, if you'd like a 4-4-2, simply move the players to a 4-4-2 configuration and save! If your feedback is that you'd like the option of having "Reset Players" move all players back to a 4-4-2 instead of a 3-4-3, that is good feedback and could be future enhancement. Please email us at support@sandcrater.com to clarify! I'm not sure if you want to be able to draw the field "lines" yourself (that is saying that you don't like my background picture) or if you are saying that you'd like to be able to draw lines on top of the display. If the latter, that is possible. On the iPad version, simply turn on "Drawing Mode" and you will be able to draw lines. As of Version 1.7, those lines are now saved when you save a white board to a file. If you are an iPhone user, simply perform a single finger vertical swipe to turn drawing mode on. Once in drawing mode on an iPhone, double tap to exit drawing mode. In Soccer Whiteboard there is a bug/issue where hand drawn lines do not show up when you are not in drawing mode. They will print and/or be saved to photos if you use those features. I will look into this issue for the next major release. Soccer Whiteboard, like the other sports white board applications, was derived from Hockey Whiteboard. Please see the history section of Hockey Whiteboard for more details!